Ther. 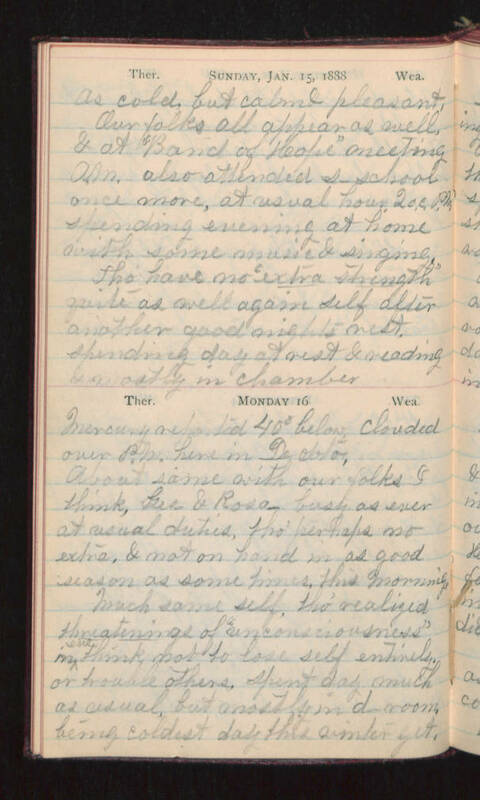 Sunday, Jan. 15, 1888 Wea. As cold, but calm & pleasant. Our folks all appear as well, & at "Band of Hope" meeting A.M. also attended s_ school once more, at usual hour 2 o.c. P.M. spending evening at home with some music & singing. Tho' have no "extra strength" quite as well again self after another good night's rest. Spending day at rest & reading & mostly in chamber. Ther. Monday 16 Wea. Mercury reported 40 [degrees] below. Clouded over P.M. here in De Soto. About same with our folks. I think, Geo. & Rosa._ busy as ever at usual duties, tho' perhaps no extra, & not on hand in as good season as some times this morning. Much same self, tho' realized threatenings of "unconsciousness" in eve think not to lose self entirely or trouble others, spent day much as usual, but mostly in d_ room being coldest day this winter yet.